We have twins - two Belgian Malinois born in the same sac. Supposedly this is somewhat rare and the pups will always be the same gender, etc. The trouble with it is that if Donner has an issue, Blitz gets it too. 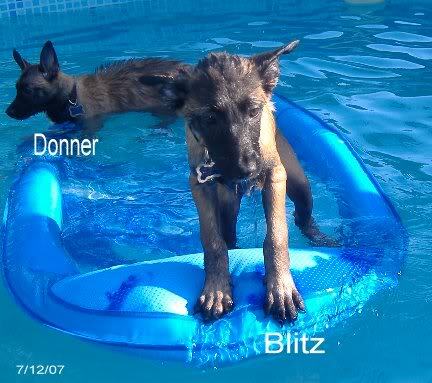 For instance, Donner had a sore on his hind end that we had to get cleared up where he had been licking it. No sooner did I get that cleared up when Blitz started licking himself too, to the point of making a small sore. Now we had to treat that one. They'll also jump on the bed and scratch the same place at the same time or pee at the same time together. Those are the cute things; the problems are not cute because if one gets it the other simply must make sure he has the same problem. We've had skint toes, a couple of small hot spots and just minor things that has to double. With that said, I wouldn't trade them for the world. Here's an older picture of them doing what they love; swimming!